A few nights ago I looked up from a book and said to my husband, “Remind me to never read sad books about children when I’m pregnant.” He looked at me in exasperation and said, “Gah! When is it ever a good time for you to read sad books about children?” That’s a fair question. 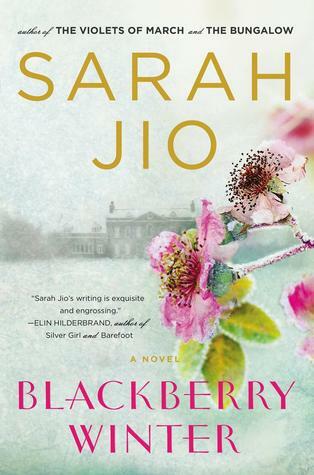 But I chose to read Blackberry Winter by Sarah Jio because I loved her writing and story telling style in The Violets of March. Somehow, I trusted Jio not to plunge me too deeply into the depths of despair. Yes, it was a mostly blind decision, but it turned out to be a good one in the end. If you’ve read many of my posts, you know I’m not a big fan of the back-and-forth between history and present day narrative. However, I think there are some writers who do a good job with it and Sarah Jio is one of them. The difference maker is Jio’s ability to make both times and all characters involved come to life. Each character in the two books I’ve read by her faces circumstances that are really, really, hard. Jio brings in the everyday tragedies of the human experience – miscarriages, losing a parent, unhappy marriages- the things that are always happening to someone, somewhere, into her writing and still manages to leave readers with a brightened outlook on life. I also appreciate how Jio can deal with some messy, true-to-life themes in her writing without feeling the need to drag readers through the muck of every detail. In other words, there is no hint of erotica or violence in her writing. That’s something I really appreciate. When I finished Blackberry Winter, I wanted it to keep going. That odd friendship between a reader and book characters formed that only really good books can create. I’m eagerly awaiting Jio’s latest book, Goodnight June, to become available at my library. Until then, you might find me at the library in the J Fiction section, because apparently I’ve missed quite a few Jio novels in the last few years. Perfect for summer reading! So whatchya’ reading this summer?